I am the mother of a child with special needs, and I commit parenting no-no’s everyday. Not just the “I’m-not-perfect-and-I-fail-occasionally-like-everyone-else-does-because-we’re-only-human” type of parenting no-no’s, no sir. Rather, I intentionally practice the art of bad parenting in specific times throughout the day and execute these times with precision, and poise. Well, maybe not poise–I’m kind of clumsy and scatter-brained. But you get the drift right? Since my daughter has some neurological conditions including Sensory Processing Disorder, she requires a lot of extra attention and specific care. So what on earth am I doing intentionally trying to parent poorly? There was that time, first thing in the morning. I set my two-year-old in front of the computer screen and let her watch animated children’s songs on You-Tube. Not while I rushed around trying to prepare breakfast, clean the house, or fold laundry. Instead, I sat taking in the sunrise on the front porch, coffee in one hand and a devotional reading in the other. And it was glorious. Only a few short months ago, I would have been rushing to get breakfast ready and clothes packed for the day. My mind would have been fretting over the articles about the effects of blue light from screens impacting children’s brains, and how they are especially harmful to children with ADHD. My daughter would have been running around, screaming because she didn’t want to get dressed, her clothes were too tight, the sun was too bright, her cereal was the wrong shape, etc. I would have held her and comforted her–it’s not her fault her nervous system is out of whack, this is all part of Sensory Processing Disorder and it effects every moment of her day. I would have put on a calm front, whispered that it was okay, that she was safe, and she would have clung to me for half an hour before I was able to get up, put my contacts in and grab a cup of coffee. But it would wear on me. 14 tantrums a day before breakfast is exhausting, to say nothing of the cycle repeating all day long. Oftentimes I would run out of steam by 10 am and have to parent on fumes the rest of the day. So, from that first time I realized that I could start my day peacefully and fulfilled by letting her watch a few cartoons, you’d better believe I took advantage of it. At first, there was guilt. Then, I saw who I became–a better mom. To use the cliche, I put my own oxygen mask on first, and it left me refreshed enough to help my daughter. She and I still snuggle in the mornings, sipping juice and coffee respectively, but it isn’t out of a desperation of need. It’s because she wants to. Kids with SPD often need extra time to wake up and adjust to the day, and that’s exactly what I gave her. There was that time I put her in time out when she was misbehaving. Oh, wait–that’s what good parents do, isn’t it? The trouble is, it was the last time I did it. 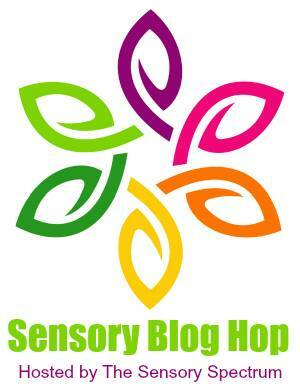 Sensory Processing Disorder=no self-regulation. She can’t calm herself down, which is the whole point of time out, so she screamed uncontrollably and grabbed me so tight, until I finally gave up. And, because I had pushed her to the point of a full blown sensory meltdown, it took another hour of comforting her before she stopped crying. If you parent a child with SPD, you know how creative you have to be with disciplining, and how it can exhaust all your mental, physical, and emotional energy. There was that time I made her stop eating her vegetables. Normal toddlers eat when they are hungry and stop when they are full. Leave them to their own devices. But not SPD children. Earlier that week she had projectile vomited a green smoothie all over the grocery store because I didn’t make her stop eating in time, and she ate herself sick. So yes, I took the vegetables out of her hand. She has no idea when she’s full, because she can’t feel full. As an SPD parent, you know the normal rules of eating go out the window. Sometimes, ‘bad parenting’ is required to get your child to eat at all. Or to stop eating. There was that time I decided to renounce following any particular parenting style. The only thing all of the ‘parenting styles’ seem to agree on is that I’m doing something wrong. 😉 Some days, my child needs an authoritative figure when she is misbehaving, and some days she needs someone more permissive and patient when she is overwhelmed and frustrated. Sometimes, I even have to be a *gulp* helicopter parent. I hover over her, clearing her path from any sensory threat I see looming about. Do I worry I’m doing her a disservice by removing her obstacles and making life too easy, you ask? Um, no. If you followed us around for a day, I think you would see her life is anything but easy. But she keeps fighting, so I’ll keep fighting for her. And to fight at my absolute best, sometimes I use bad parenting, and I use it to my advantage. 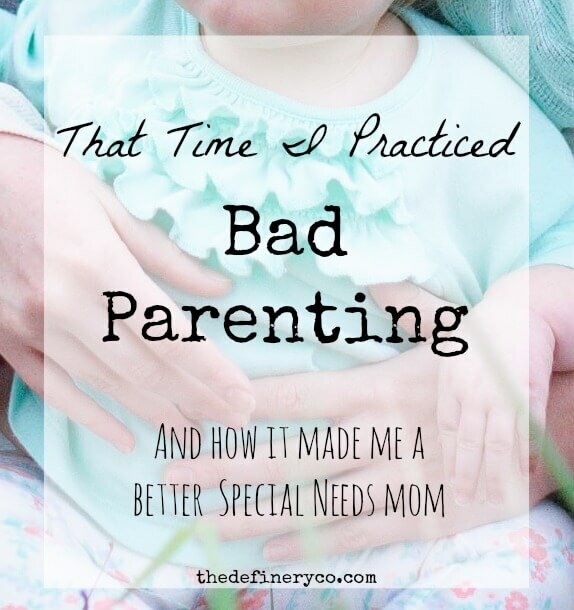 I am a huge advocate for ‘the art’ of bad parenting, because I have seen it make me a better mom and caregiver. So tell me, what bad parenting art forms do you use to make yourself a better mom? When you begin to realize all the parenting advice contradicts with other parenting advice, when you’ve lived in different communities with Very different parenting cultures; when you’ve got children who don’t fit the “typical” mold…you start to realize that whatever works for your family (whatever it’s makeup), at a particular time is RIGHT.